Getting Started with Brushes XP, Saturday 20th October 2018. This one day workshop will introduce you to digital drawing and painting on your iPad or iPhone and is suitable for the beginner and those with more experience. 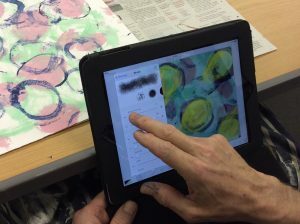 There will also be the opportunity to create work of a more practical nature, helping you to consider how digital work may aid and support drawing and painting with your preferred media. Saturday 20th October, £65, including materials and refreshments; you should download Brushes XP (£3.99) to your device ahead of the workshop. For more information and bookings email: enquiries@lizwellby.co.uk.